The Philippines wants modern Russian weapons to combat ISIS-linked terrorists, the country’s president Rodrigo Duterte told his Russian counterpart after declaring martial law for 60 days in the South and cutting short his trip to Moscow to deal with the crisis. The meeting between President Vladimir Putin and Duterte was scheduled for Thursday but was brought forward to Tuesday evening after the Philippines president declared martial law and was forced to return home. 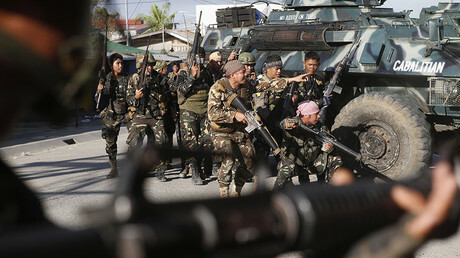 The declaration followed a shootout between government troops and Islamic State (IS, formerly ISIS, ISIL) aligned militants in the southern city of Marawi. “I came [to Moscow] to secure your support and to confirm our friendship,” the Philippines President said as he met Putin. 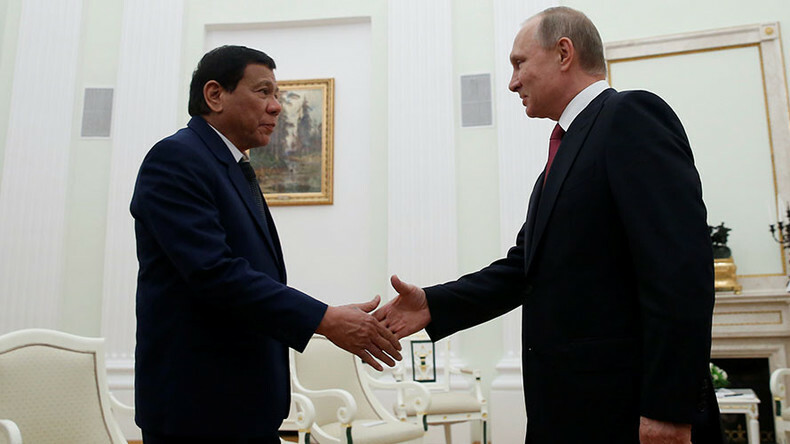 Duterte, who called Russia a “reliable partner,” also emphasized that Manila is ready to develop relations with Moscow and is looking forward to purchase Russian arms to fight terrorists in his country. “Of course, our country needs modern weapons. We had orders in the United States, but now the situation there is not so smooth, and in order to fight with ISIS, with their units and factions, we need modern weapons,” Duterte told Putin. Prior to his Monday’s arrival in Russia, Duterte said Manila signaled his interest in buying small arms, helicopters and jets from Moscow to fight its drug war and terrorist insurgency. While Washington used to supply weapons to Manila, Duterte previously said that procuring arms from the United States might be challenging because the US was heavily criticizing the alleged human rights abuses in his country. “Of course, cooperation in the military-technical field is possible,” Putin told Duterte at the Kremlin, adding, that the countries have many other prospective areas of cooperation, including in the areas of power, engineering, energy and transportation. Putin also expressed his condolences over the killing of two soldiers and one police officer after the Islamic State-aligned Maute Group of terrorists occupied parts of Marawi City. “I want to express my condolences in connection with the death of people in your country that happened as a result of the terrorist attack,” Putin told Duterte, saying that he and Russian people “fully understand” why Duterte was forced to cut short his trip. “I want to express hope that the conflict will be resolved as soon as possible with minimum losses,” Putin added. 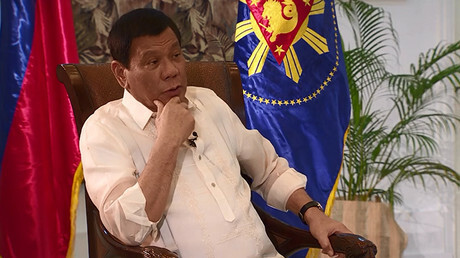 The Russian leader also said despite Duterte’s early leave, the two countries will still sign the full set of documents that had been prepared by the delegations. “Your ministers will stay here and tomorrow this package of documents which is aimed at the development of our bilateral relations, will be signed,” Putin said. Duterte was also forced to cancel his Wednesday meeting with Russian Prime Minister Dmitry Medvedev because of the developments in the Philippines. “The government is in full control of the situation and is fully aware that the Maute/ISIS and similar groups have the capability, though limited, to disturb the peace,” presidential spokesman Ernesto Abella told a news conference in Moscow. Also speaking in Moscow, Defense Secretary Delfin Lorenzana said additional soldiers would arrive in Marawi Wednesday morning to expel terrorist snipers from the city. He stressed that the situation in Marawi City is under control and that security forces are only holding position to give reinforcements time to arrive. On the plane set to depart Moscow for Manila, Duterte said the martial law will be "harsh" and will not be different from the rule of Ferdinand Marcos who ruled under such a decree from 1972 until 1981. "Martial law is martial law... you have experienced martial law, it would not be any different from what President Marcos did. I'd be harsh," said Duterte. Duterte also suggested that the measure, which is to last for 60 days, may be extended even further. "If it would take a year to do it, then we will do it. If it's over within a month, then I'll be happy," he said.